Engraved with animals and flowers in roundels against a dense floral ground. Traveler’s coffer or trunk, very generally rectangular in form, the sides, front and back gently swelling and curving under to a flat bottom; the top slightly domed, secured on the back by two metal loop hinges and on the front by a pendant flap protected by a metal plate and fitting over two metal loops to hold a lick. On the front and back each are two broad, flat loops, used to secure straps or cords tied around the trunk. 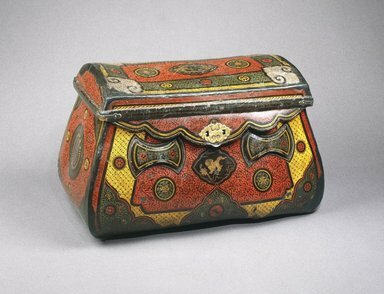 The entire outside of the trunk, with the possible exception of the bottom, is covered with an elaborate graffito decoration in colored lacquer. Various colors, including red, green, yellow, gold, and white are overlaid with a layer of black and the design is cut through the black to reveal the color underneath. All visible surfaces are decorated in this manner with dense patterns and designs, while plain black covers the areas concealed by the overlapping edges of the lid. The elaborate decoration consists of variations of a number of design elements. The backgrounds are filled with dense red floral designs of five-petal flowers and small leaves springing from winding stems. On the top, back and front, these are set off against geometric ornament based on floral designs, the main area surrounded with narrow bands derived from scrolling palmetto designs. The corners of the top, back and front are accented with variations on a pointed "cloud collar: design composed of alternating simple curves and broad spirals. Each of these forms on the front and back is filled with an all-over stylized flower and leaf design. The corners of the top are filled with a "fish scale" design. The broad areas of the design are highlighted with carefully drawn roundels, each revealing at the center a pinhole from the compass used to draw the roundel borders. The rounded designs include various stylized six- and eight-petal flowers, flower and leaf medallions, and an axially symmetrical abstract design possibly representing two birds circling each other. In the center of the back panel is a four-pointed medallion depicting a goose flying with a long stalk of grass in its beak. On the front is a similar panel showing a mythological lion chasing a brocade ball with long trailing ribbons. An on the top is a panel with two circling "fenghuang" Chinese phoenixes, distinguished by details of their plumage as male and female. Under the flap on the front is a 13-character inscription, also cut through the black top layer of color, reading "Wenzhou xinhejie anningfang xia Ou jia shenghuo", that is "Made by the Ou family of Wenzhou, Xinhe street, Anning ward." Song (960-1279) and Yuan dynasty (1279-1368) lacquers with inscriptions noting their place of manufacture, including Wenzhou in Zhejiang province have been excavated in China in recent years. An 1147 description of the Northern Song capital at Kaifeng specifically mentions lacquer transported approximately 600 miles from Wenzhou. Condition: The trunk has been cleaned and conserved by Roger Bolton-Smith, London. In general the lacquer surfaces have been consolidated over areas of loss or major repair with plain black.